Truffle and Ganache - your personal local Ethereum like blockchain and full toolset for smart contracts. Best for quick start. Setup your own local copy of Ethereum. Closest to real world. As for me I've chosen the last one, because I wanted to be close to real world Ethereum Blockchain and still have the possibility to configure all tools myself to get additional knowledge about how it works. Bootstrap container acts as the node you can use for RPC and setups initial users. To make it close to real world there is second node called eth, which participates in validating transactions. Both of them are linked to Netsat for monitoring purposes. Go to Netstat again to validate mining has started. So now we have local Ethereum network fully functioning and RPC is available on http://localhost:8545. Always wanted to learn Go, so inspired by this article I decided to use Go as a basic language for interaction with contracts (deploy, fetch info, update info). To interact with Ethereum blockchain we need to use its RPC. However, writing the boilerplate code that translates decent Go language constructs into RPC calls and back is extremely time consuming and also extremely brittle: implementation bugs can only be detected during runtime and it's almost impossible to evolve a contract as even a tiny change in Solidity can be painful to port over to Go. Take a look at generated file. Most of all we are interested in DeployGreeter, NewGreeter and Greet methods. They allow us to deploy contract, bind to deployed contract and call greet method accordingly. To deploy a smart contract we will create a small Go program. docker-compose run builder bash -c "cd /contracts/samples/greeter/ && go build . && ./greeter deploy"
Note the contract address from output, we will use it later to call smart contract functions. docker-compose run builder bash -c "cd /contracts/samples/greeter/ && go build . && ./greeter greet 0xFF37a57B8D373518aBE222Db1077eD9A968a5FDf"
Replace 0xFF37a57B8D373518aBE222Db1077eD9A968a5FDf with your contract address. You should see "Hello I am your first deployed SC!" in the output. That's it! We have deployed our first smart contract and called a function! Remember we have Go bindings for Smart Contract? Nobody stops us from using them in conjunction with Go based web API. For testing purposes I've generated an API application using BeeGo. Of course I dockerized it and made a service. You can see the code here. One important thing to remember that you need go-ethereum packages to use generated smart contracts bindings. explorer - exploring blocks, transactions and addresses of local bockchain. 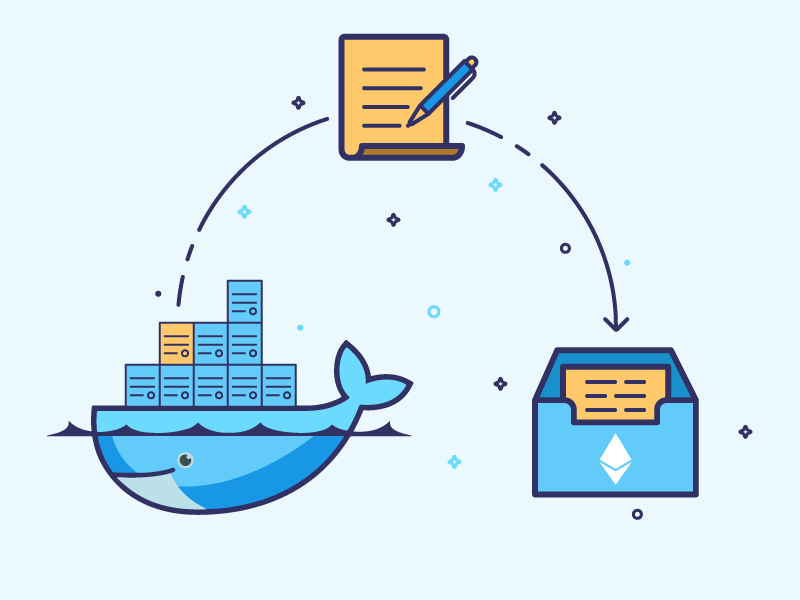 Pros: It is close to real world, you can setup your own blockchains anywhere with Docker, you have full control over your development tools, easily extendable, no additional software setup except Docker and Docker Compose. Cons: No visual interface for building and deploying smart contracts (you can develop it yourself or use some tool as a service), resource consuming during node mining. All code source from this article is available here.